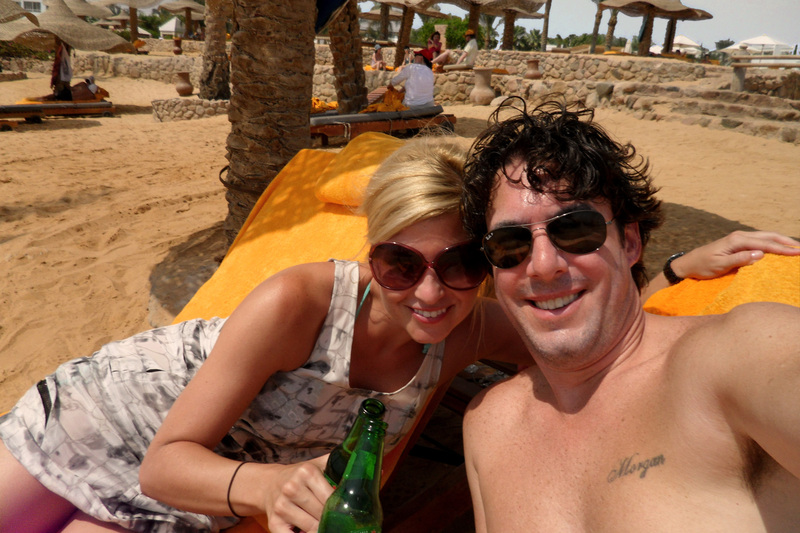 We decided to end our vacation to Egypt on a totally relaxing note. And, what is more relaxing than the beach? 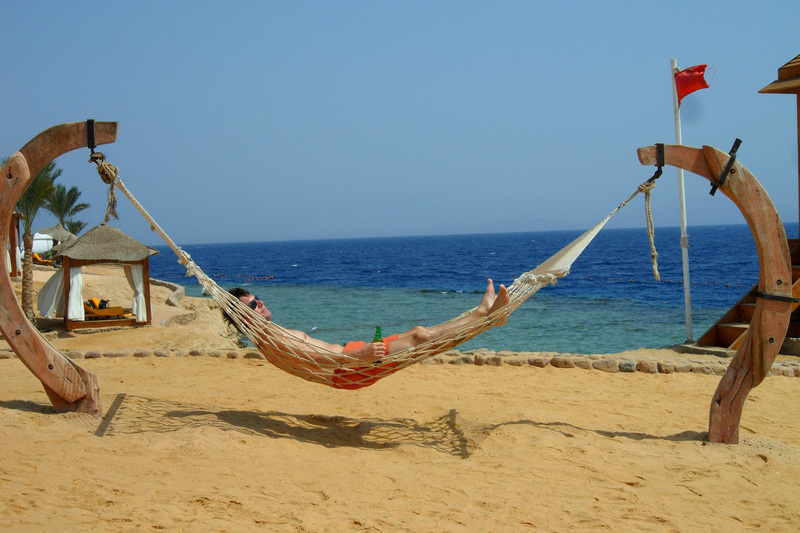 Also, how many times do you get the chance to beach it up by the Red Sea? I mean…I just wanted to see for myself how impressive Moses’ work was. Honestly, it is a big sea. I am pretty sure he broke a sweat while parting it. The beaches were beautiful and the snorkeling was incredible to say the least. In fact, on the walkway out to the resort’s snorkeling platform, we saw the most colorful and exotic fish either of us had ever seen…in just 2 feet deep of water! We are not certified divers, but I can only imagine what an experience that would have been. 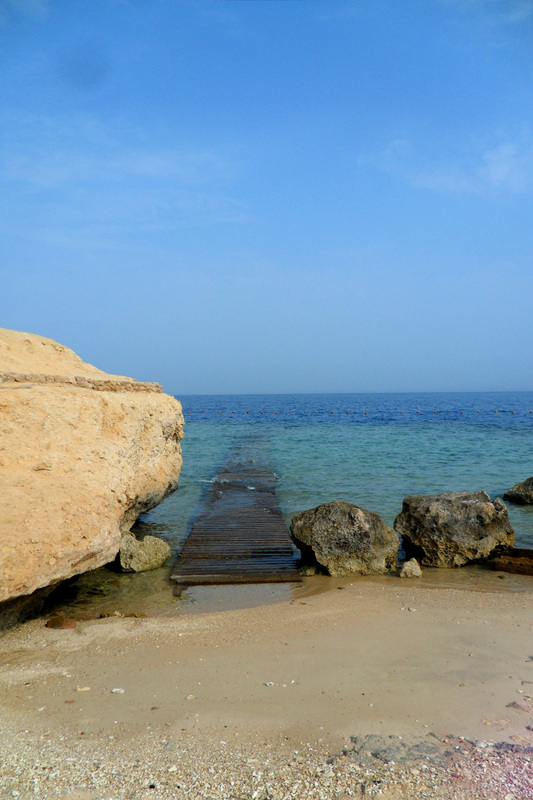 For all the divers out there – Sharm el Sheikh should definitely be on your travel destination wish list. 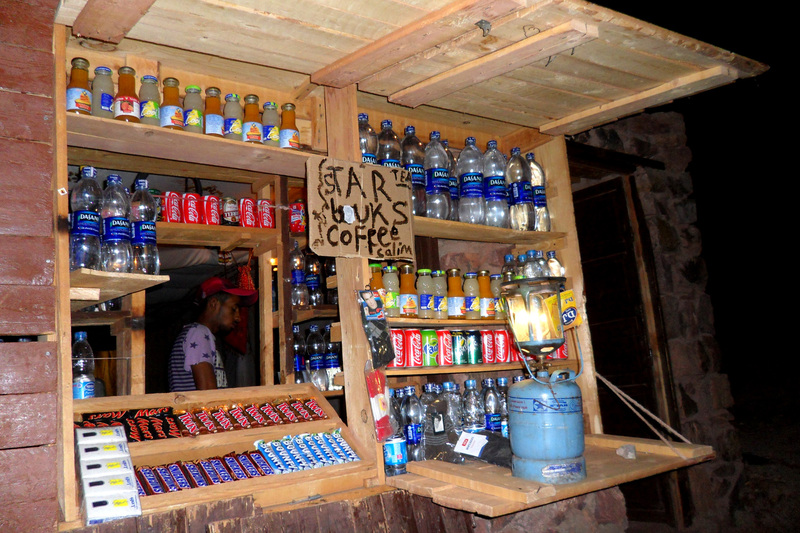 We spent 3 nights in Sharm el Sheikh. 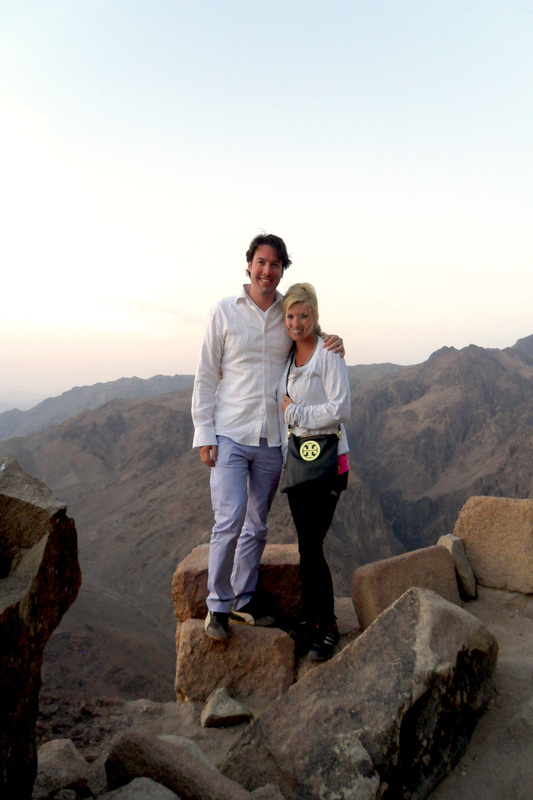 I feel this allowed us enough time for sunbathing, dining on delicious seafood, and most importantly to me – climbing Mount Sinai – i.e. Mount Moses. This was truly the pinnacle of our visit. How could we come to this part of the world and not hike the path of Moses on his mission to read the Ten Commandments? How could we not go to the site of what is believed to be The Burning Bush? By 3AM we were at the base of the mountain with flashlights in hand ready for the climb. I had greatly underestimated the amount of people who would be making the journey along side of us. It was outstanding and incredibly moving. And although it wasn’t a loud crowd, as everyone seemed focused on the task at hand, I could still hear bits of the story of Moses being told in over a dozen different languages. Some visitors opt to ride a camel for part of the way or for the entire trip to the top. We opted to trek it by foot for a more accurate “Moses” experience (and honestly…our bodies needed some serious calorie burning after 2 weeks of vacation eating). It was a bit claustrophobic at the beginning of the climb as the herd of people all start at the same time. We really hoofed it (even wearing out our guide a bit) to move ahead of the crowds all the while being careful to avoid the steamy piles of fresh camel poop. In fact – we actually beat our guide’s best time to the top by over an hour! Though, I am not sure it calls for bragging rights…most of the other hikers had 20 to 30 years on us. In truth, we were extremely impressed with the devotion and ability of some of the climbers who were easily into their 70’s. We made it to the top with some time to spare before sunrise so we stopped to enjoy some coffee at what might possibly be the highest elevation Starbuck’s in existence. Clearly they don’t have the marketing budget of other locations…hence the misspelled hand painted sign. It was surprisingly cool at the top. I am quite sure the guide mentioned this to us multiple times – but when standing in 100+ degree heat at the foot of the mountain – the decision to not bring an extra jacket made total sense to me. Luckily, I have a sweet boyfriend who gave me one of the long sleeve shirts he was wearing to help me stay warm. As the sun came up over the mountain top, I couldn’t help but say a prayer of thanks. Not just for this specific experience, which was spectacular – and not just for this 2 week vacation, which was more than I could have ever hoped. I thanked God for every gift He had ever given me – with an extra special thank you for the one kissing me in this picture! Hey Morg, loved the article, as always, especially the comment about being thankful for the one kissing you!!! I am so thrilled of your travels and thankful you are such a gifted writer to be able to share them with us so delightfully. What an amazing experience to climb Mt. Sinai!